Flunkies & floozies. If ever I hosted Albedo Audio's Massimo Costa, that would be my take on the tarts & vicars costume party theme. That's because I'm a big unrepentant fan. His Aptica model is our resident example of a modern high-resolution speaker done right. Whilst it's fitted with Accuton ceramic drivers, the very similar-looking companion model Amira uses a soft-dome tweeter and woven mid/woofer. Otherwise the back-leaning hull tapering to an integral steel plinth; the acoustic 1st-order filters; the transmission line with two integral Helmholz resonators to cancel out the line's primary organ pipe resonances; the diffraction-attenuating metal perf inserts on either side of the tweeter... it's all signature Albedo. In short, the whole bag of tricks carries over from the dearer stable mate. Modern parlance calls that shared DNA design or trickle-down. I call it value up. Fanfare. Why am I such a fan? 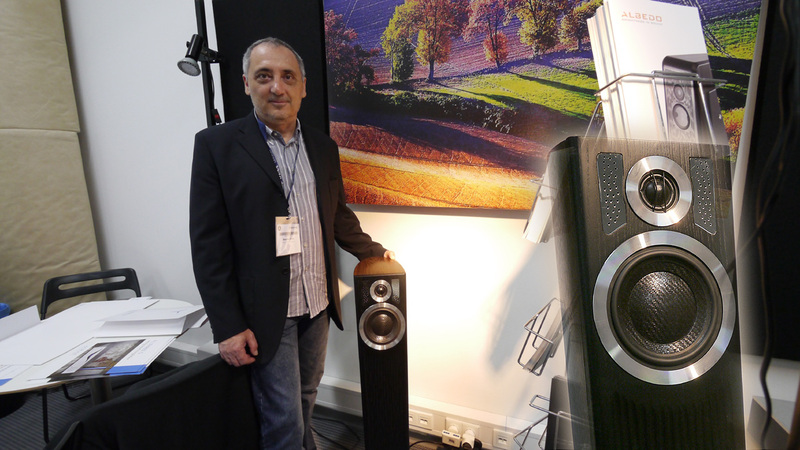 Unlike other Accuton-based speakers which can sound dry, brittle and tonally bleached, Massimo's implementation in the Aptica does not. Whilst it couldn't possibly sound like a cellulose-based Zu—owning a Druid V, why would I want two of the same?—it pursues wonderful clarity and impressive speed without getting antiseptic or nervy. The company slogan Brightness in Sound applies to the full bandwidth. 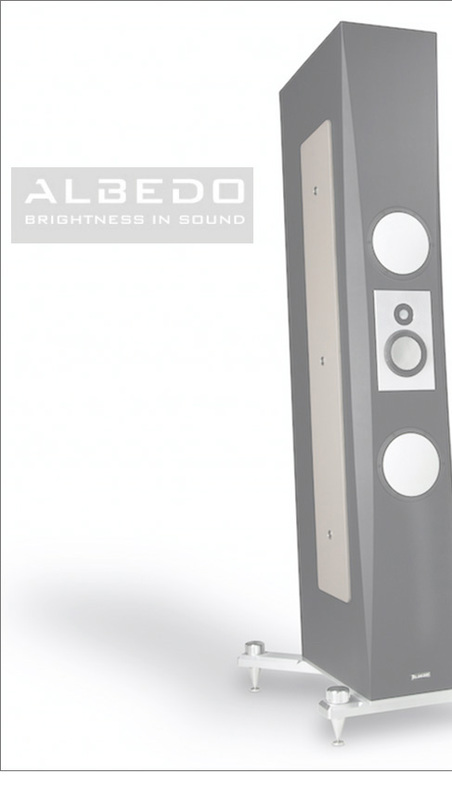 Unlike a bright treble which means an imbalance to stand out, Albedo's notion applies it top to bottom across the whole bandwidth. It wants to strip away all the cobwebs and shadows that hang between notes like a few or all of the seven veils. With market demands* adoring bigger is better, Massimo's Alecta above pays homage and duty. Still, in his heart our man adores small speakers that sound enormous. It's what led to the company's formation in the first place. Like roots music, the Amira returns him to beginnings. It implements lessons learnt. It gets a new mid/woofer without which the project would never have launched. Once this driver dropped, Massimo knew he had the right weapon to redraw the Aptica at a lower price point without letting his sonic standards slip. Accuton drivers are costly ceramic critters. They pop up in posh parties hosted by Kharma, Mårten, Tidal and Volya. That's exclusive stuff! At 8Ω and with a linear phase crossover, the Amira shouldn't be challenging to drive. 84dB sensitivity however exceeds low-power SET specs. To bring 50 to 20'000Hz bandwidth down to earth, apply your internal tape measure to dims of 101cm tall, then a 26 x 19cm constantly slimming structure whose biggest bit is the stabilizing gravity-exerting plinth. The opening shot with Massimo standing next to one really illustrates it. Despite very solid construction, 19kg/ea. make the Amira an easy and compact walkabout. * "It's a three-way, four-driver tower with dual transmission line and all ceramic drivers. The Chinese market really appreciates this model but no Western magazine has tested it so far. If you are interested, we can ship you a pair but they are 120kg each and 170cm tall." 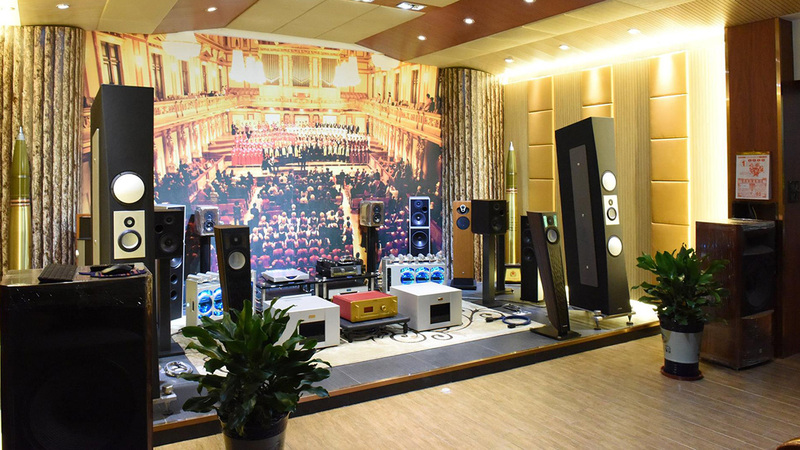 I politely declined for the reasons given in the next paragraph; and illustrated by the showroom photo of Zesen Audio in China. With an always black baffle grooved with random ripples below the 5.5" two-way head, finish options for the hull are Walnut, Rosewood and Black Oak veneer. For the Aptica, a perfect mate is the Austrian Crayon CFA-1.2 integrated. The very effective tuning of the computer-modeled line—Albedo wrote their own software simulation program to better predict the behaviour of their non-standard bass alignments—produces useful output to ~30Hz even in our large 82.5m² room with vaulted ceiling. Very elegant small floorstandards that sound positively huge? Quite. The prospect of a parallel option scaled down mostly on price but not performance was intriguing. If a quality compact speaker can deliver desired bandwidth and SPL, why put up with two monkey coffins in the living room? I don't see the appeal. Still, many people buy more speaker than either their room supports or they exploit on SPL. From a certain point onward, all that separates a big box from a smaller one is bass reach and loudness. If you don't do 200km/hr on your aural Autobahn; if you don't think that room lock or organ-to-a-pulp grinding infrabass are positives... find simpler happiness in what suits your needs. If it looks as stylish as an Aptica or today's Amira, what's stopping you? Flunkies and floozies? Take off their masks. Behind them you'll spot greed, excess and other sins which, whilst far from deadly, can still cost you dearly. The Aptica fetches from €9'660/pr in its two basic finishes to €12'790/pr for piano gloss black. The Amira is €6'890/pr for each of its three skin options. That's still dear but perhaps no longer deadly? Let's agree that the price drop versus the Accuton sibling is significant. In Albedo currency, the chorus line continues with €29'890/pr for the Axcentia MkII and €64'000/pr for the Alecta.